Our vision: The best student life. We represent students views to the University through elected student officers and hundreds of course reps.
We support student development through over 330 sports clubs and societies (covering everything from international relations to Pokemon).We also provide volunteering and sustainability programmes and many other initiatives. We provide a buzzing social hub for students, in the Richmond Building and beyond. Everything from club nights to debates and conferences - and Bristol's cheapest bar! We provide quality services such as our lettings agency and our advice service, which are key to improving the lives of Bristol students. Whatever your need, we can help! If we aren't currently providing what you need us to, come and speak to us and we'll see if we can collectively make it happen. 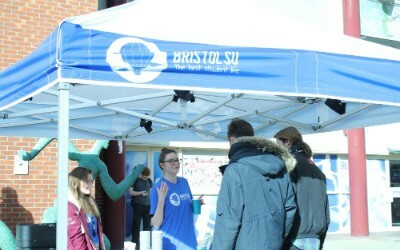 Bristol SU is a registered charitable company (as we have to be by law) and so we are affected by The Charities Act and Education Act (1994). Student groups are legally part of the Students’ Union, and so the laws regarding charitable companies also apply to student groups, and affect what the Union and societies can spend their money on. The purpose for which Bristol SU may spend its funds are defined by the Union’s Articles, these are called the objects of the Union and are noted in the table below. Any expenditure other than for those purposes stated is classed as Ultra Vires and is therefore illegal. providing social, cultural, sporting and recreational activities and forums for discussions and debate for the personal development of its members. Ultra Vires is a phrase used legally to mean anything beyond our stated aim. Legally we are not allowed to make any ‘ultra vires’ payments, so we cannot spend money on things that are not achieving the stated aims of the Union or the society. Any donations are also affected by the legal rules on charitable companies – in their most basic form, this means we cannot donate union money to other charities, political parties, campaigns or trade unions. When considering Ultra Vires we use the following three ‘golden rules’. Students’ Unions shouldn’t use their resources to campaign on an issue that does not affect “students as students”. The Union should not use money to subsidise charity fundraising but the Union can grant funds to a fundraising society to put on events / activities due to the personal development / educational benefits to the event organisers. The Union should not donate money to other charities. You can still fundraise, but you need to cover the costs from money raised or from society money that is not from the Union. Clubs and societies can only use Union money to fund campaigns directly related to members as students. You can only use Union money to subsidise places on demos which relate to student issues e.g. top up fees. If campaigns do not fall into these categories, the Union cannot fund them. If a campaign did not fall into the permissible categories, you can fundraise and use the club or society membership account to fund the campaign as you wish.